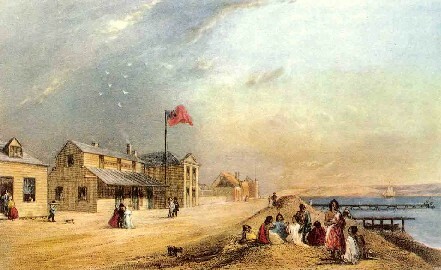 In August, 1841, a party of friends, of which I made one, determined to seek a home in the southern hemisphere. We embarked in the ship Mandarin, for New Zealand. Our social circle consisted of three families, or nine individuals, the heads of which had served together many years abroad, and so were knit by ties of no common kind. The occurrences of similar voyages have been so often related, that we shall pass over ours in silence, and while the ship is pursuing her way across the deep, offer a few observations of a general character. For some months previous to quitting England, the question of emigration had with us been seriously pondered, and every accessible source of information diligently perused. Guides to emigrants, travels, newspapers, missionary reports, and such Parliamentary papers as were accessible were all in turn consulted; but here let us observe how extremely difficult it is to obtain a true account of any one province of our Colonial Empire. If solely guided by the avowed organs of the colony we can never come to a sound conclusion. They colour high the advantages of their respective fields of colonization, but observe a discreet silence on their demerits. Statements from this source are invariably one-sided. Paid advocates may assume the appearance of candour, but this should deceive no one ; "It is their vocation" As far as they do go, we give them credit for sincerity, but it would ill accord with the express object for which they are got up to tell the whole truth. Guide-books owe their compilation to parties similarly interested; and should the smooth current of the emigrant's thoughts he ruffled by a traveller's plain tale, the disagreeable impression is not suffered to continue long. Party organs teem for a time with a host of seeming evidence for the other side, and the voice of the individual is soon hushed amidst their clamour. Or, perhaps, they seize on some weak point, and directing their critical power hither, overturn him in the field of diction, if not of facts. Every now and then a letter from the colonies finds its way into some of our leading journals, and if they breathe, as they too often do, a spirit of disappointment, the Company's agents are at work, and the writers denounced as misanthropes, comfortable nowhere, - agitators busy everywhere, or persons evidently not adapted to an infant colony, and who, consequently, should have staid at home. And thus it happens that by far the great majority of emigrants know little of the defects of their adopted country until they land on its shores. But one by one they unexpectedly make their appearance, and unable longer to delude themselves, confess they have been deceived. How then, it may be asked, does it happen that so little is heard in England of the discontent existing in the southern colonies, or rather in the first and principal settlement of the New Zealand Company, for it is of this only that we write? Already has one cause been pointed out, and we will briefly mention others. Capitalists have nearly, without exception, bought their land in England. They must make the best of a bad bargain, and those who are on the spot remain silent for the sake of their own interest. Again, the principal landowners are absentees who manage their property by an agent in Wellington. Now it is the interest of this class to keep up the market price of land, but go to the Union Bank of Australia and endeavour to effect a mortgage on your estate, and its manager will tell you that the Company's price is merely nominal. It is not, therefore, from agents that absentees will learn the worthless nature of their purchases, and in making this statement we mean no disparagement to the men employed. On the 21st of December the Mandarin made the New Zealand coast. Its appearance, as seen from Cook's Straits, was not very promising, but we were elated with hope, and easily persuaded that though frowning mountains fringed the shores, there might be open country beyond them. A strong and favourable wind soon carried us inside the heads of Port Nicholson. The passengers were all on deck straining their eyes to catch a glimpse of civilization. Little was said, though disappointment was visible on the countenance of every one. In whatever direction the eye fell it was on mountains, rising in the blue distance, ridge above ridge, in continued succession. As the vessel shot up the harbour, a few cattle browsing on the lower slopes of a fern-clad hill were hailed as a favourable omen, and our hearts gladdened as we counted them over to each other. At length on rounding Point Halswell the settlement came in view, and its picturesque appearance prolonged the cheerful impression which the last sight imparted. A canvas cantonment was what most of us had anticipated; but here the beach was lined with wooden buildings, while along the sides of the hills were dotted neat cottages, the smoke from which, rising among the trees, sent many a heart back to the happy firesides of similar structures in our own country. About 3 o'clock in the afternoon the Mandarin cast anchor in Lambton Bay, abreast of the settlement. After landing we proceeded to the surveyor-general's office to register our sections of country land, and there learned, to our astonishment and mortification, that these were to be given out 112 miles from Wellington. A second emigration was thus rendered necessary and a fortnight after the Mandarin's arrival, one of her steerage passengers paid £60 for the conveyance of himself and family by sea from Port Nicholson to Wanganui. Before returning to the ship we paid our respects to the Company's agent, who, as might have been expected, spoke great things of the settlements; but while we sat with him we were compelled to listen to a settler's opinion on this subject. Mr. Mason, from the river Hutt, complained of native aggression in no measured language, and requested the interference or protection of the Company's agent. Colonel Wakefield confessed himself without power, and referred the complainant to the police magistrate. The man retired, but not before he had said enough to open our eyes to the true state of this question, rendering more than doubtful the quiet possession of our land guaranteed by the honour of the Company. When the gale which set in on the night of our arrival ceased, our luggage was landed; and after seeing it housed, we proceeded to receive from a surveyor possession of our town acres. One of these crowned a ridge rising immediately from the beach, called Wellington Terrace, which comparatively was a good situation. The other was distant three miles from the inhabited part of the town. In search of the latter we were accompanied by two gentlemen who had been some time resident in the colony, but who had not hitherto seen some town acres belonging to absentees, for which they were agents. In looking for the latter in a swamp, the surveyor could not find firm footing, at which the gravity of the party gave way, and they were fain to rest content with a general indication of the locality of the acres, without endangering their lives by a search in the morass. This excursion proved to us that, save Britannia Flat, at the north end of Wellington, and a swampy valley named Te-Aro, near its southern extremity, there was not a level acre in the township. We now pitched our tents on the acre upon Wellington Terrace. Mine was a sad failure, and stood only a night, while those of my friends being smaller, weathered the gale for months to the surprise of many in Wellington. The best tent in the lot was made on the outward voyage by Captain Sharp and Mr. Robinson. I succeeded in purchasing a small wooden house upon the beach, and by the aid of a cradle and a train of bullocks, drew it to the top of the Terrace. The very first night we slept in this little building it blew a gale from the south, and about midnight we were awoke by its rocking to and fro. Fearful of being precipitated down hill, we were not slack in ballasting the house with heavy trunks, boxes, etc., and when morning broke it was more effectually secured. The suburban land attached to the acre upon Wellington Terrace had been given out, and selected in Tukapu, and to this district we now accompanied a surveyor to take possession. The party was made up of a dozen gentlemen, going out on a similar errand. The district is distant twelve miles from Wellington, and is approached within four miles by the Porirua foot-path. A surveyor's line has been run through this last portion, and along this cutting we scrambled over its hilly surface, as often using our hands to climb as our feet to walk. Darkness overtook us, and we spent a very comfortable night in the bush, undisturbed by the fear of venomous reptiles or beasts of prey. At daylight next morning we continued our toilsome march, and arrived abreast of the section early in the forenoon. To examine it very minutely was not possible. In whatever direction we turned, a net-work of strong pliant creepers repelled all advance, while the circle of vision was limited to a few yards by the heavy foliage of majestic trees and the uneven character of the ground they stood upon. At this spot we left the party and struck down a surveyor's cutting for Porirua harbour. The line had been badly cut, and we lost the direction ; but after floundering on for some hours we came upon the bed of a rivulet, by following which we reached the sea. There was no passage under the cliffs, hut through a mangrove swamp that lined the shore ; this we got safely through, though often above the middle in water, and between nine and ten at night reached Wellington, considerably fatigued by the exertions of the day.